I & C Watts' bathroom fitters based in Harrogate provide professional bathroom fitting and installation services for all Harrogate residents. We cover all aspects of tiling and bathroom fitting ranging from the simple package bathroom installation to larger commercial projects with custom-made bathrooms. We have been providing new bathrooms to Harrogate homes for the last 35 years. Our bathroom fitting team can provide tile designs and can tile any room from wet rooms to conservatories. Any appliances installed have seamless finishes and guaranteed seals. Investing in a high quality bathroom and letting us give it the perfect finish will also be a major selling point when deciding to move home. Previous clients will confirm our team are committed to providing the highest standard of service with the minimum disruption to you and the rest of your home, making our service very individual. See our Portfolio for examples of recently completed projects. 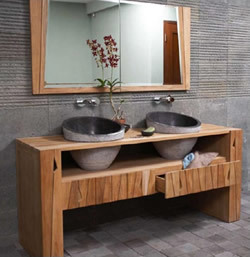 Bathroom vanity cabinets are an essential component of any bathroom and can add drama to your design and decor. Bathroom sink cabinets provide countertop space, a place for the sink and faucets and for great storage below. It is amazing how often bathroom cabinets and storage are left out of the planning process. It is important to have a place for everything in your bathroom that is easily accessible to everyone. Bathroom vanity cabinets and storage provide home organisation and reduce clutter. You never can have too much bathroom storage! If you would like to discuss your bathroom requirements or find out how much your desired bathroom might cost to install, contact us and we will happily provide a no obligation quotation.